To enter the giveaway, please take the actions suggested below. Take more actions to increase your chances of winning! Matthew McGlynn, founder of Roswell Pro Audio, has studied microphones for many years. After seeing the same components turn up in most of the budget microphones, Matt was convinced that by switching out several components, he could achieve a tremendous improvement in sound. And he was right! So he started selling DIY upgrade kits to manually modify and improve the sound of budget microphones through his company “microphone-parts.com”. As the company evolved, they started producing all-inclusive kits, featuring only the components they found to work best together over the years. With these kits you could not only upgrade your microphones – you could build your own microphone all together! Roswell Audio produces these custom microphones fully assembled, so there is no risk of messing anything up and you don´t have to be tech savvy to get to enjoy their amazing sound. Each of their microphones is tested and LISTENED TO personally before shipping it out to ensure the highest quality. 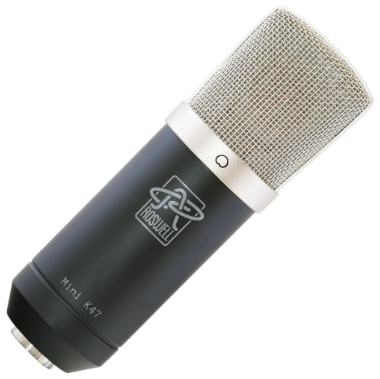 The Mini K47 is a large diaphragm condenser microphone that provides a full bodied, balanced tone with a natural top-end. To support it´s high quality capsule, the K 47 features modern and clean sounding circuits, which let the sound of the capsule pass through without alteration. While the microphone´s capsule provides a vintage vibe and feel, the clean and neutral sounding circuits keep the noise floor and distortion values low. – Modern performance with a vintage tone! The K 47 has gotten raving reviews and is said to sound more musical and balanced than most other microphones in this price category. But you be the judge: Listen to samples of the K 47 used on various instruments here. I hope you enjoy this giveaway. To enter, please take the steps suggested above. Remember: The more actions you take, the bigger your chance of winning! Free Audio Editors: Cutting Tracks on the Cheap!